Game description: Fifteen years after the events of Suikoden II, the stories of Hugo (the son of a village chief), Chris (the virtuous Knight of Zexen), and Geddoe (the rebellious unit commander) intertwine as they gather the 108 Stars of Destiny. 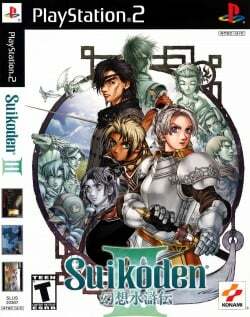 Suikoden III features three different battle systems and three styles of combat in a 3D world. Customize each of your three character's skills, and then pair them together to unleash devastating combo attacks. Suikoden III shares many elements with other role-playing video games. The player controls the current protagonist and travels with them around the world map, advancing the plot by completing tasks and talking with other characters. In towns, they can gather information, sharpen their weaponry, learn new skills, and buy equipment; wilderness areas generally feature random encounters with monsters. Aside from the main plot, after a certain point in each main character's chapters, they may recruit new characters to go to Budehuc castle. Recruiting a character often requires a short sidequest or other mission. Unlike Suikoden II and Suikoden V, Suikoden III has no "time limits" for character recruitment; assuming certain plot decisions are made "correctly," it is always possible to recruit all 108 Stars of Destiny. Konami did not release Suikoden III in PAL territories. A European version was announced but cancelled a few months before release, allegedly due to problems with the conversion tools. Konami's policy at that time was that all PAL games had to be fully translated to the respective languages and that only releasing the game in English was not an option. Petitions to change Konami's decision on the matter were unsuccessful. Workaround: The sepia effect will work correctly in software mode (F9). This page was last edited on 16 April 2019, at 09:41.